The Southern Illinois University Edwardsville Morris University Center’s Goshen Lounge was overflowing with scholarly excitement as students from SIUE Graduate School’s myriad programs showcased their research at the Graduate School Research Symposium on Monday, April 1. 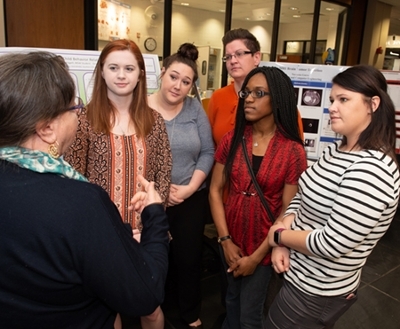 The annual event celebrates the research efforts and accomplishments of students, featuring research poster displays, creative exhibits and oral presentations. At the symposium, more than 50 graduate students had the opportunity to receive feedback from faculty and experience presenting their research publicly. “Being able to dive in and take ownership of this research project has been an incredible experience,” said Dana Lewis, of St. Charles, Mo. Lewis is pursuing a master’s in integrative studies with the cultural heritage and resources management specialization. 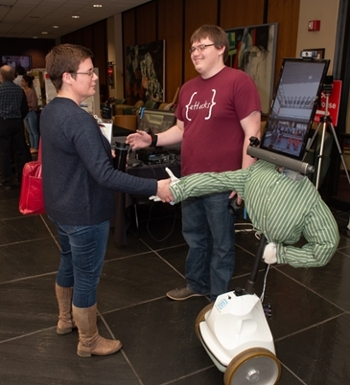 Down the row of poster displays, Zach Anderson demonstrated his research involving a telepresence robot. The computer science master’s candidate has had the opportunity to work with psychology, mechanical engineering and computer science scholars from SIUE and Saint Louis University on the project. Assistant researcher on the same project, Clare Bass, emphasized the value of this research experience as she studies to become a child and family therapist. The symposium concluded with The Chancellor’s Researchers Reception, an event that honored student presenters, faculty and staff who submitted external grants during the year. First time principal investigators received special recognition. Photos: A team of social work master’s candidates discuss their research on the effect of child behavior related to parental stress during the Graduate School Research Symposium. SIUE computer science graduate student Zach Anderson demonstrates the robotic arm on a telepresence robot that can move and mimic a remote user’s movements. 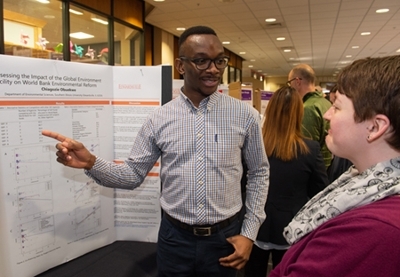 Master’s candidate Chiagozie Obuekwe shares his passion for environmental policy while explaining his research project. 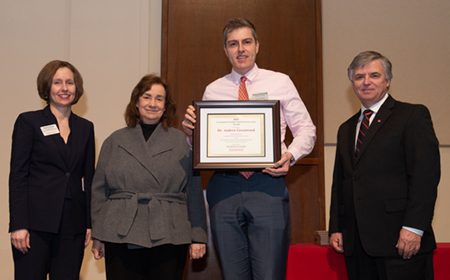 (L-R) SIUE Graduate School Associate Dean for Research and Graduate Studies Susan Morgan, PhD, PE, Sandy Doreson, daughter of the late Dr. Vaughnie Lindsay, Andrew Greenwood, PhD, Vaughnie Lindsay New Investigator Awardee, and SIUE Chancellor Randy Pembrook, PhD. 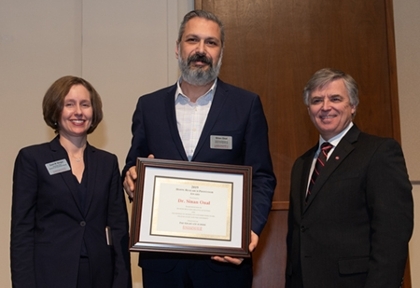 (L-R) SIUE’s Susan Morgan, PhD, PE, Hoppe Research Award recipient Sinan Onal, PhD, and SIUE Chancellor Randy Pembrook, PhD.